This morning I noticed Jefferson was not eating – not even a treat – and was being very lethargic. He’d lost a lot of weight over the last 8 months, and he looked even more gaunt than he has recently. I took him into the vet, and by noon she called with the bad news: Jeff had had what she called an “acute renal incident” and whatever measurements they used on his kidneys were “crazy high”. I spent most of the day agonizing over what to do: To have him hospitalized for 2-3 days getting hydrated and perhaps getting close to normal, and then facing daily subcutaneous fluid injections and other treatments for perhaps a few months to two years of life, or deciding that, as the vet put it, he’d had a good 16 years. By late afternoon, I decided to do the latter. The vet said she thought it was a reasonable decision, that his measurements were not good and it was no guarantee that he’d get back to normal. Debbi and I met at the vet and said goodbye. Jefferson was snuggly and cuddly, and just before the doctor came in he wanted to get put down on the towel on the exam room table, where he lay down. The doctor gave him a sedative (he didn’t close his eyes, she said they never do), and then she put him to sleep for good. It was very quiet. he even had one lip curled up like he did sometimes. I didn’t take a final picture of him lying there, and I decided not to keep his ashes. That’s not the sort of person I am. He’ll go to kitty heaven along with several other kitties, and I’ll have my memories and my photos of him. I got Jefferson and his brother Newton (well, I was told they were brothers) from the humane society in October of 1994, when they were 6 months old. I’d left graduate school in May, started working at Epic in June, and moved to my first solo apartment in August. I’d been going to the Humane Society twice a week for several weeks looking for just the right kittens. It was awfully hard, not adopting the other kittens or cats. 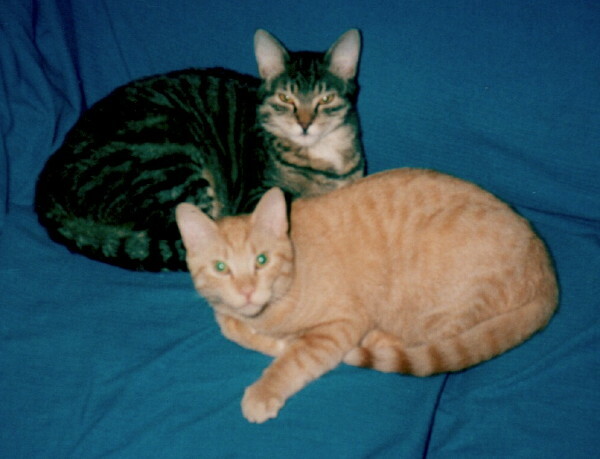 I remember in particular two 11-month old orange tabby brothers who were there for week after week; I hope they got adopted. Jefferson and Newton showed up one day and I immediately put in to interview them. I was told that someone else had put in to interview Newton, but when my appointment came later that week it turned out they’d decided not to take him. The two of them were full of energy, jumping all over me and my then-girlfriend Colleen, and I quickly decided they were the guys for me. 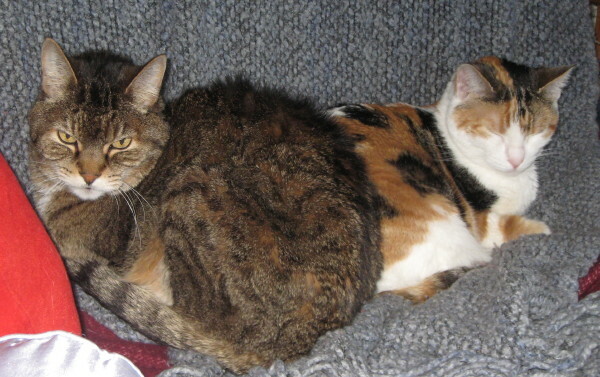 The Humane Society screwed up and didn’t neuter them on the day they were supported to be neutered, so I had them home just for a weekend before I had to take them in again, and leave them overnight. That was hard, too. But then they were home for good, little bundles of energy running around my apartment. It took me a month to name them. They totally stressed me out getting into things, and just being the “little brown guy” and the “little orange guy”. Newton named himself by always falling off my lap while rolling around getting petted. Jefferson’s name just came to me as one that matched Newton, when I decided I had to give him a name, to make him feel more like a member of my home. But it fit. Newton was the bold one, but Jefferson was the smart one. I’m sure he figured out how to open my front door – if only he could reach the handle. I let them both into the building’s hallway, where they’d go down the hall and intimidate my friend Jim’s cats, walking right into his apartment if we let them. Those early years, the brothers were inseparable. They’d snooze together and play together, habits they grew out of in their later years. Early on Jefferson would climb into bed with me and curl up alongside my torso; over time he’d move to the foot of the bed (probably because of the extra-comfy blanket I draped down there at the time) and lounge over my foot. When I moved to California, the cats flew in the cargo hold. When they came out the other end, Newton was hiding at the back of this cage, while Jefferson was loafed up front and center, with a look that said, “I am never going to forgive you for this, you realize that, right?” Both cats (predictably) never liked moving to a new home; they’d slink around the place on their bellies, and then hide somewhere until nightfall, at which point they’d come out and check everything out. They got it all figured out pretty quickly, though. One day I came home from work and pulled up to my car port, thinking, “Hey, that orange cat sitting at the foot of the stairs to my floor looks just like Newton!” In fact, it was Newton – at some point during the day they’d pushed the screen out of a window over the kitchen sink and gotten outside. Who knows how long they were out there, and it’s lucky they weren’t killed. Jefferson ran back inside as soon as I went upstairs, but I had go down down to entice Newton back. When Debbi got her kittens, she brought them down every weekend. Blackjack had delusions of being top cat, but Jefferson was having none of it, and quickly taught the kittens their places. Despite this, Roulette loved Jefferson, and the two of them became fast friends, mostly curling up in the papasan together every evening. Jefferson always seemed just a little put out, but sometimes he’d give in and lick Roulette’s head. I think the coming of the kittens spelled the end of Jefferson and Newton’s close relationship, though. They rarely slept together anymore, and Newton would sometimes play dominance games by holding Jefferson by biting the scruff of his neck. 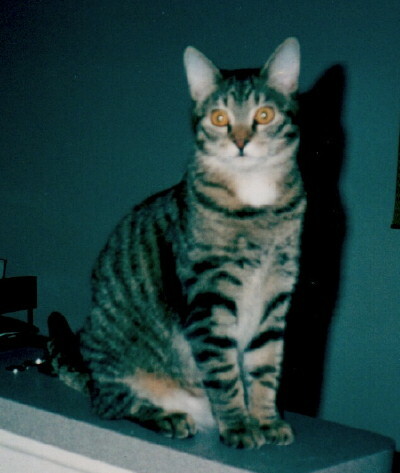 Most of all, though, Jefferson was my cat – no one else would do. I’d come home and he’d jump down from the bookcase upstairs and come running down to greet me, and then follow me around meowing at me until I picked him up. Other people were not sufficient, and he’d only grudgingly give them attention. He was always quick to purr his deep purr (it took Newton quite a while to find both his purr and his meow). When I was on the phone, Jefferson would jump into my lap, or meow at me if I wasn’t sitting down, no matter where we’d each been when the phone rang. Debbi often said that Jefferson wanted everyone else to just go away, so it would be just him and me. This morning Newton was meowing his head off around 3:15 in the morning. In retrospect I wonder if he knew something wasn’t right. On his last day Jefferson came in to greet me when my alarm went off. He came down for breakfast, but didn’t eat. He went up to lie in the sunbeam for several hours, and later I found him sitting in the green cat couch in the hallway – a couch he’d claimed as his some time ago – and finally in the cubbyhole of the cat tree. He meowed all the way to the vet. 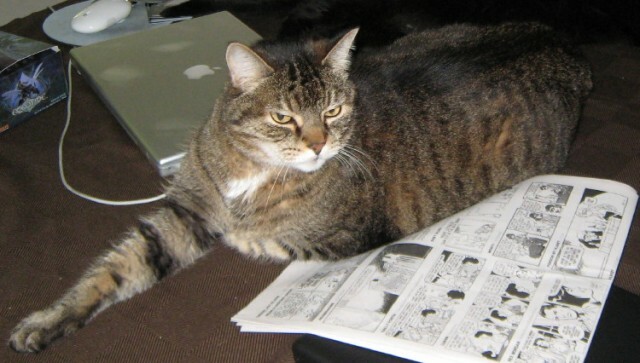 He’d gotten down to 8 pounds – literally half the cat he once was. After we said goodbye, I went to buy comic books (I listened to podcasts of Wait! Wait! Don’t Tell Me! on the way, which helped take my mind off it by making me laugh), and Debbi put away our two-sided feeding dish and found a round ceramic one for Newton. The other three cats seem a little bewildered, but I don’t think they know why. Oddly, Blackjack is the one who’s been walking around yowling. Jefferson would have been 16 years old next month. That’s a pretty good run for a cat. I’ve known for a while that cats at that age can go very quickly. Maybe we could have gotten a few more good months with him, but maybe they wouldn’t have been good months. It will take me a little while not to think about that. Goodbye, Jeff, my little brown guy. I honestly could not have asked for a better cat. I love you and I’ll always miss you. I’m so sorry. I know how hard it can be. It’s totally normal to second-guess your decisions, too. Everybody I know that’s had to have their pet put to sleep agonized over whether it was the right time or not. I’ve known people who extended their pets lives for months where the animal never got to play, never ate normally, needed injections every day, etc, etc. It can be a very selfish thing to do… You did what you thought was best, and that’s all anybody can ever do. Like Mark said, you made the choice that was right at the time. 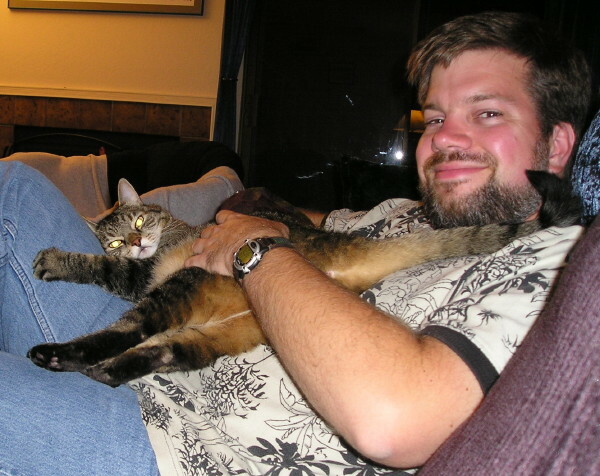 Jeff was a great cat. He’ll be missed. Sounds like he was a good cat and had a good run. Like I said on Twitter, hope you’re alright and my thoughts are with you, man. Jefferson was a handsome, good-tempered cat who lived his life to the fullest. I know you will miss him but if he couldn’t get well it was the right thing. Agree with your mom; if my allergies would let me keep a cat, I’d have wanted one like him. A very good run indeed.